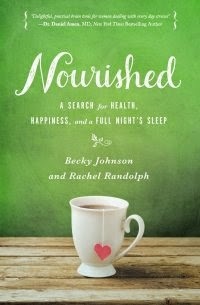 When I read the description on the back of the book Nourished: A Search for Health, Happiness, and a Full Night’s Sleep by Becky Johnson and Rachel Randolph, I was intrigued because I knew that I needed a little more nourishing and balanced lifestyle. As you begin this book, pour yourself a cup of something warm, You will feel like you are right with the authors~ Becky Johnson and Rachel Randolph, they make you feel like you are in the room with them. 1) Divvy up your days of the week into work days, "stuff" days, and free days. 2) Pair dreaded tasks with pleasant experiences to make them more palatable. 3) Keep a list of quick and easy menus to get you through those "can't think of a thing for dinner" days. 4) Drape your "less than best" assets in black and don't fret about your shape.